I am a new contributor to the forum and I hope I have selected the right place to post my new topic. I have recently chanced upon a Dylan concert photo in a garage sale. It is an original Fujifilm photo of Dylan performing live (in the 80s, I suppose) but I don't know anything else about it. Would anybody know what concert it was and if the photo is worth anything? 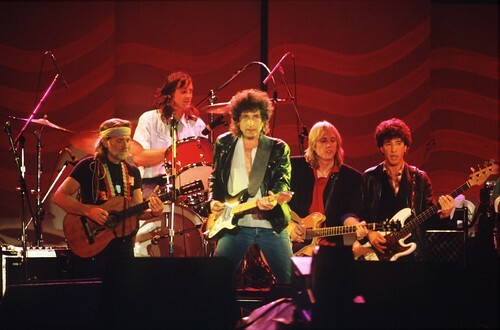 The guy behind Dylan is Mike Campbell (Heartbreakers guitar player)... so 1985 (farm aid) or 1986 or 1987. This one is Farm Aid 1985. I'm pretty sure I've seen it before, so nothing rare. Yes, I'm familiar with that pic too, but I'm not sure where I saw it. The "underscore" between the words (Bob_Dylan) pressed in the back, makes me think that maybe the original was a high resolution file and not a "photographic negative". Because the underscore is highly regarded to informatic systems. The back of my own photos from these years had only numbers, but I'm not a an expert, of course. Maybe someone can explain this thing so much better. You can be pretty sure that this picture it's a professional shot from Farm Aid 1985. September 22, Champaign (Illinois). If you have some other information, the picture was inside an envelope or something that can add some information? Hi, thank you so much for your interest, i'm really grateful! The guy I bought it from originally found it inside a box of LPs he had purchased from some other guy. There was also a photo of Aerosmith's Steven Tyler and Joe Perry live. A similar series of number on the back +"Aerosmith". 8"x10'' is the size of both photos. Ok, similar numbers in the back, merchandising then. There must be lots like this, this is the kind of stuff you can find in some record stores or in those stores that sells t-shirts, patches and those kind of things. It's not a rare picture or unseen picture, but it's a really nice picture. That makes sense, thanks. Too bad it's not one of a kind but I agree it's a pretty cool shot. Quite difficult to make those shots now in concert. The security guys will jump in your face. I'm going to the Luxembourg concert, can't wait! One of the first I bought when I began collecting photos.